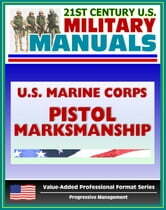 Part of our value-added professional format series of U.S. military manuals, this U.S. Marine Corps manual provides techniques and procedures for Marine Corps pistol marksmanship. Marines must have the versatility, flexibility, and skills to deal with any situation at any level of intensity across the entire range of military operations. Whenever the situation warrants the application of deadly force, a Marine must be able to deliver well-aimed shots to eliminate the threat. A Marine who is proficient in pistol marksmanship handles this challenge without escalating the level of violence or causing unnecessary collateral damage. It is not enough to simply provide Marines with the best available firearms; we must also ensure that their training prepares them to deliver accurate fire against the enemy under the most adverse conditions without hesitancy, fear, or uncertainty of action. A well-trained Marine is confident that he can protect himself, accomplish the mission, and protect his fellow Marines. 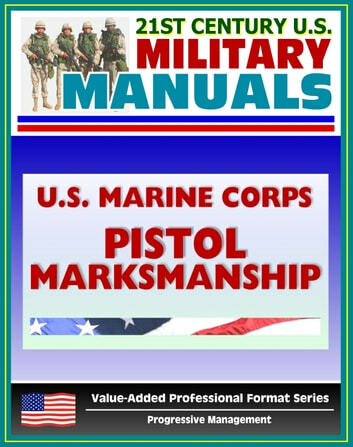 To be combat ready, a Marine must be skilled in the tactics, techniques, and procedures of pistol marksmanship and diligent in the proper care and maintenance of the M9, 9-mm service pistol. Marine Corps Reference Publication (MCRP) 3-0IB, Pistol Marksmanship, is the Marine Corps' source document for pistol marksmanship and provides the doctrinal basis for Marine Corps pistol marksmanship training, This publication provides all Marines armed with a pistol with the tactics, techniques, and procedures for range and field firing the M9, 9-mm service pistol. The manual describes the Marine Corps mission and functions: The Marine Corps shall be organized, trained, and equipped to: (1) Provide Fleet Marine Forces of combined arms, together with supporting air components, for service with the United States Fleet in the seizure or defense of advanced naval bases and for the conduct of such land operations as may be essential to the prosecution of a naval campaign. (2) Provide detachments and organizations for service on armed vessels of the Navy, and security detachments for the protection of naval property at naval stations and bases. (3) Develop, in coordination with the Army, Navy, and Air Force, the doctrines, tactics, techniques, and equipment employed by landing forces in amphibious operations. The Marine Corps shall have primary interest in the development of those landing force doctrines, tactics, techniques, and equipment which are of common interest to the Army and the Marine Corps. (4) Provide, as required, Marine forces for airborne operations, in coordination with the Army, the Navy, and the Air Force and in accordance with doctrines established by the Joint Chiefs of Staff. (5) Develop, in coordination with the Army, the Navy, and the Air Force, doctrines, procedures, and equipment of interest to the Marine Corps for airborne operations which are not provided for by the Army.